Blog Choosing a WordPress theme? Will You Buy or Customise it? Choosing a WordPress theme? Will You Buy or Customise it? While you are at your website development journey you would reach a stage where you’d have to select a theme for your website. WordPress offers a wide range of themes to choose from. But the confusion lies in whether to create a custom-designed theme to suit your business or to select one of the existing themes. In this post, we shall address just that and hope you are clear on what kind of theme you would choose. Let’s state the pros and cons of these two options. That will help you weigh out the options and come to a conclusion. Let’s say you want to move into a new house. You have two option you could build your own house the way you want it to be, or you can pick a house that has already been built. Now, both these options have their pros and cons. 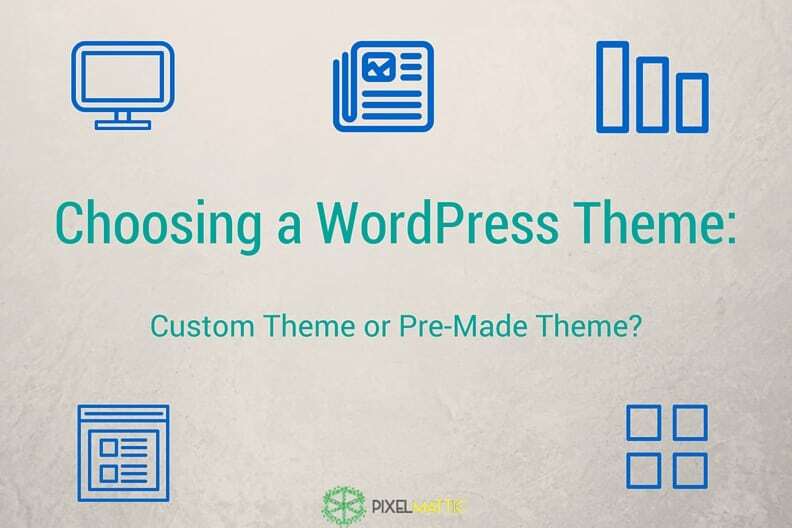 Let’s draw an analogy to help understand the two options you have about choosing a WordPress theme. It is like building your own house. You know exactly what you need and can plan the whole architecture as such. This is a perfect option but would have its own cons, such as the time needed to build a complete house and getting it EXACTLY how you want it. Similarly, you can customize a theme to suit your brand/business. Let’s go over the pros and cons of doing so. Unique: you will have a custom design for your website theme. You have a big advantage of being different from the other competitors. Flexibility: You can have all your custom needs to leverage the theme just the way you want it. Lightweight: The fact that this is a customized theme, the coding involved in this process will be ‘light’ as only what is necessary can be incorporated. This also improves the performance of your website. Boilerplate theme frameworks for a quick start: Helps to create fast, robust, and adaptable web apps and sites. Can take longer: Making your own theme will not be a swift process. It will take a lot of time to build and polish that perfect theme. Built for a specific use case, it will be tailor-made for your business. Multipurpose customization can be expensive. As incorporating a lot of functionalities on to one theme will be costly. This is similar to choosing a ready-to-move-in house. All the structure and rooms are done, you need to choose the house that best suits your needs and pick that. It might not be the perfect house for you, but works out to be good and if you are constrained on time, this does seem like a good option to go with. That is how it is to choose a WordPress theme that already exists. A choice that closely resembles what you want and fits best for your brand. It is less time consuming. 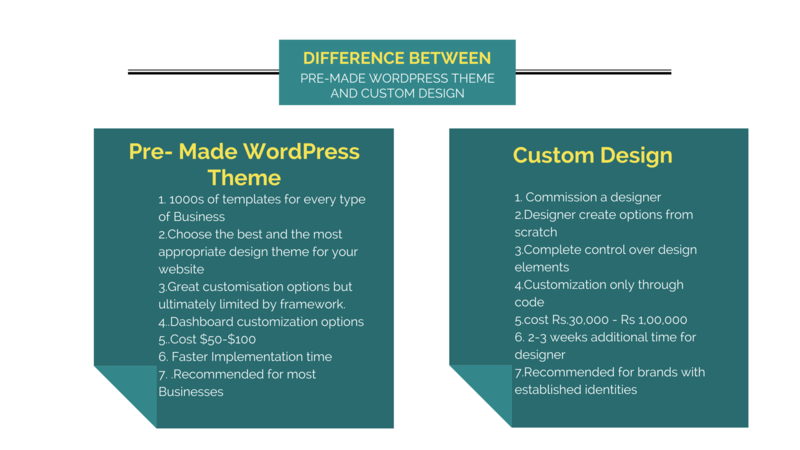 Cheaper: Finding a pre-made theme that fits all your criteria will definitely help save you on a lot of money. The main disadvantage of buying a theme would be to use it within it’s boundaries and you cannot customize it. Heavy and bloated because of features and plugins: As compared to lightweight customized themes, the WP themes that are there are designed to cater to a wide audience. Hence, they include a lot of inbuilt features that may not be required by your particular brand and website. This created the unnecessary ‘bloat’. Dependent on theme developer support, You need to know how well do they support the theme, with regular updates. If they use clean codes and are abiding the WordPress rules. Theme updates and compatibility issues: WP released updates, this means that the themes must also update accordingly. This is required to ensure compatibility with the latest versions of WP. When a theme fails to keep updates with recent versions it can cause bugs and issues. Can’t review code before purchase. You must trust the marketplace to do the code review for you. Not many marketplaces actually abide by the rules of the wp’s theme and plugin guidelines. This might affect security and performance of the website as a whole. Do you need our help in deciding what to choose for your website? Get in touch.